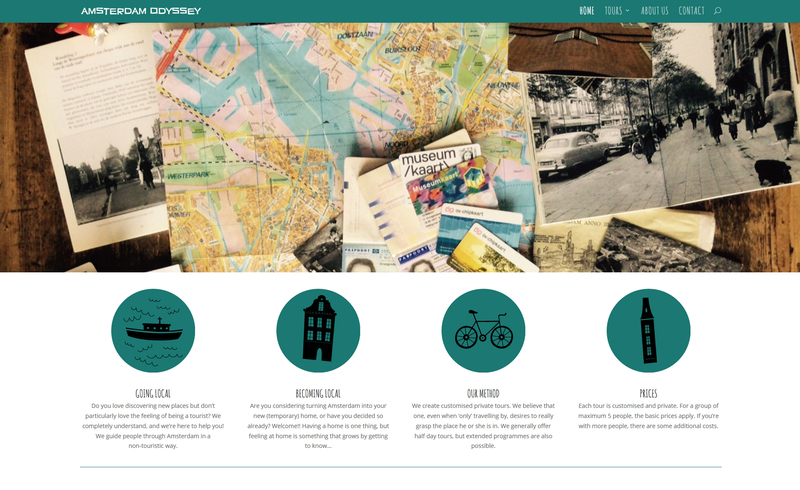 Amsterdam Odyssey is a new Custom Tour company based in Amsterdam. They believe that one, even when ‘only’ travelling by, desires to really grasp the place he or she is in. And so they offer half day tours, and extended programmes for tours in Amsterdam. The brief was to create a logo that emphasises adventure, is robust, clear, with an influence of Bauhaus and the 70’s and is using saturated colours. Using inspiration from designer Saul Bass, I developed this branding, and migrated the look to their website. The website is an information site used to advertise their upcoming tours and connect with their clients. Here is the design for the business cards! Loving the full splash of colours that these cards have. This is the website design that I developed together with Eva & Hanneke. I really enjoyed working with this team, and their ideas were easy to translate into a clear and strong brand for Amsterdam Odyssey. Eva & Hanneke have started giving specialist tours in Amsterdam, and wanted a booklet to give out to their clients. Amsterdam Odyssey wanted marketing material to publicise their tours. I designed & printed this A5 flyer for them.